Wood pellet grills are prized for the versatility and ease of use. However, there are a few minor complaints that pop up with many of them. At the top of the list is the fact that it only offers indirect heat. 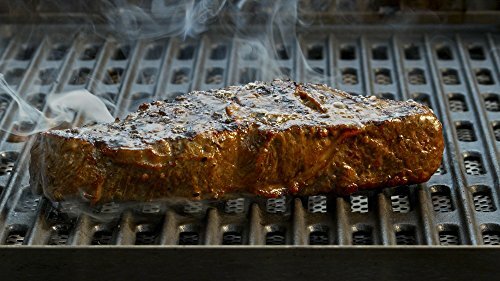 This means that a wood pellet grill can’t give you that steakhouse sear that you want when for certain cuts of meat. There are two ways that wood pellet grill manufacturers attempt to deal with this. Each has its own camp that debates the merits. The first is to provide a sliding broiler plate. This is a metal sheath at the bottom of the primary firebox that exposes a portion of the fire roaring within. The problem here is that it’s a little fiddly, especially if you say want to switch from indirect smoking to direct fire in the same session. You sort of end up developing special tongs techniques to try to slide a little piece of ripping hot metal with smoke billowing in your face. The other method, which Camp Chef uses with their DLX SmokePro is to use a side searing box. 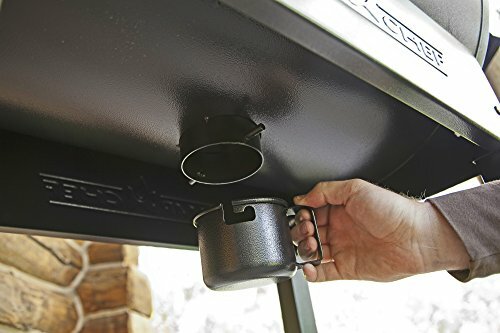 This is essentially a small propane grill that can be attached to the right-hand side table or another nearby flat surface. 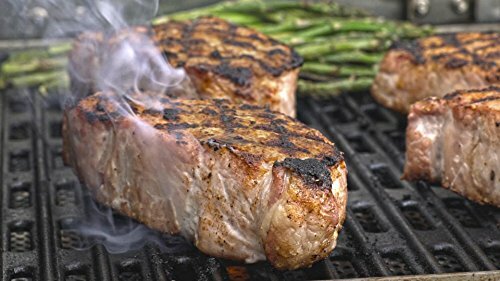 This allows you to use some direct heat grilling in the middle of the same session where you are smoking. The Camp Chef DLX SmokePro has a high capacity wood pellet hopper that includes a pellet purge system. This allows you to empty out leftover wood pellets after each smoking session to prevent them from breaking down if they start to react to ambient high humidity in the air. It also has a patented ash cleanout system that speeds the cleanup process. There is also an internal grease management system that drains excess drippings and rendered fat into a small cup under the primary chamber. Camp Chef makes quality and priority throughout most of their product line. This is echoed in the DLX SmokePro. One very strong testament to this is the fact that this particular grill was named Best Value Pellet Grill and Smoker in the Industry 2017. Yet there is one minor flaw to bear in mind. While the grease management system does a good job of collecting rendered fat, excess marinade, and other drippings, the reservoir cup is pretty small. During a short cooking session, you likely won’t have a problem. With a longer session, the cup could reach maximum capacity, or simply be so full that it’s precarious to remove and pour it out. 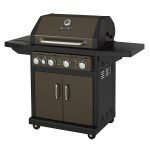 When it comes to assembly, you need to decide if you are going to attach the propane sear box to the side shelf, or if you want to use it as a stand alone propane grill. There is a little bit of personal preference in this. Sure it’s nice to have a functional side shelf, but if you don’t attach the sear box, you will likely end up chasing it around on your deck. Not to mention if you don’t keep it close at hand, you are just buying a high priced gas grill. Assembly takes a while with the Camp Chef DLX SmokePro. 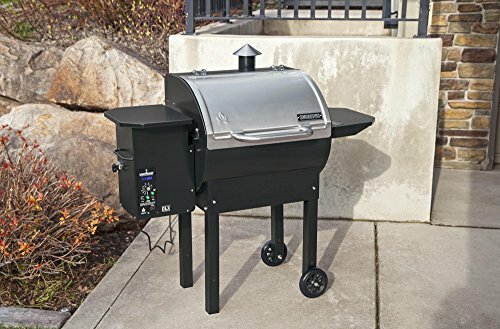 Wood pellet grills, in general, take a while to put together. Adding on the propane-fired sear box increases the time it takes to get it ready to use. For what it’s worth, this grill does not come with any propane tank, which is yet another purchase. Camp Chef uses with their DLX SmokePro is to use a side searing box. 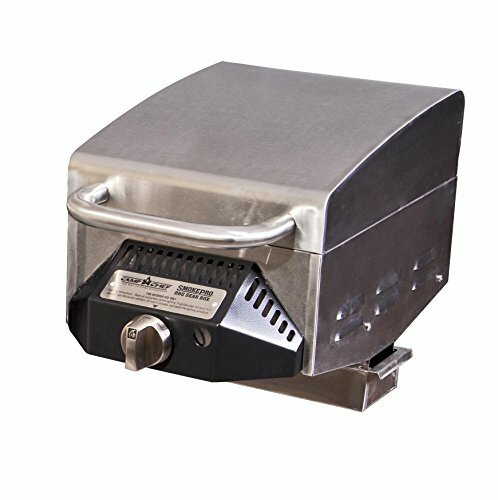 This is essentially a small propane grill that can be attached to the right-hand side table or another nearby flat surface. 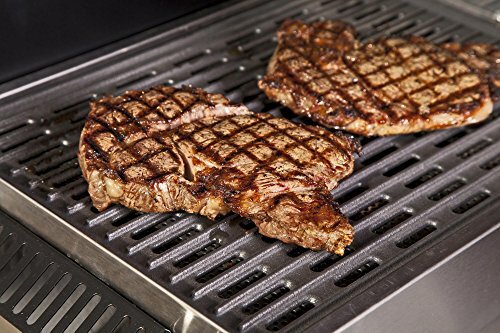 It allows you to do some hybrid grilling. For example, you could smoke some chicken breasts or chicken thighs in the primary cooking chamber until they are tender and perfectly perfumed with smoke. Then you can move the meat over to the sear box to mark it and crisp up the skin. The wood pellet grill itself does everything you want it to do. Just keep an eye on the drippings cup during a long cooking session. The Camp Chef DLX SmokePro provides 570 square inches of cooking space. This is enough for you to prepare a large brisket, three to four pork shoulders, or a staggering number of racks of ribs. 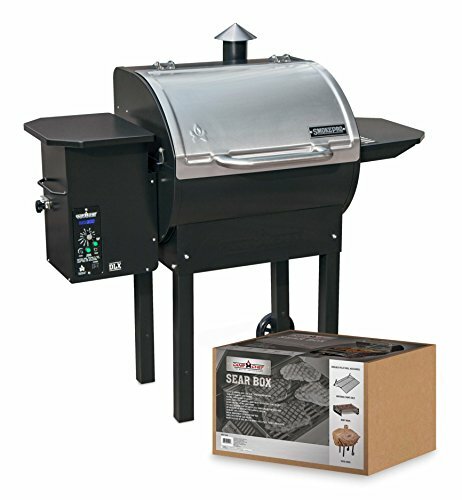 The propane-fired sear box provides 184 square inches or direct heat grill space. With proper placement, this is just enough to sear and mark off four ribeye steaks. The grease management system does a very good job of collecting drippings, excess marinade, and rendered fat. Just keep an eye on the small drippings cup. The patented ash cleanout system, and the wood pellet release help with cleanup, as well as preventing problems with leftover wood pellets becoming jammed in the hopper. 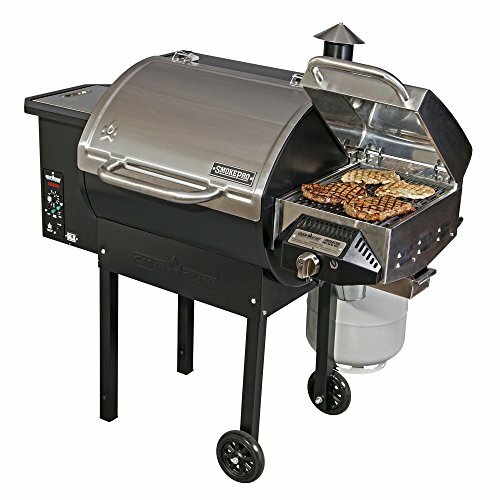 The Camp Chef SmokePro is quite possibly the easiest to clean wood pellet grill on the market. The ash clean out system makes it incredibly easy to remove spent wood pellet ash, without the concern of accidentally sucking up a rogue ember into your shop vac. The wood pellet purge feature is also well-designed. You see wood pellets are made from wood fibers that have been bound together with natural lignin, which is water soluble. If the ambient humidity levels in the air are high, it can cause the lignin to soften enough to bind the wood pellets together. The solid block of wood pellets it leaves behind can be frustrating, and the material cannot be reused. The wood pellet purge system spares you this hassle. When you are done cooking, you just dump the pellets back into the original bag and bring them indoors for safe storage. The Camp Chef SmokePro comes with a 3-year no hassle warranty. 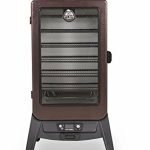 This is a blanket warranty that they offer with all wood pellet grills and is the standard for units in this category and price range. It’s hard to turn away from the Camp Chef SmokePro and all it’s easy to use innovations. It’s even been named the best value in its class. Just keep an eye on the small drippings cup, and take your time putting it together.